The festive season is upon us and the excitement is slowly gaining momentum as we prepare for this fun filled time of the year. Everyone wants to enjoy the holidays without any hiccups so here’s a few things to consider over the next few weeks before the celebrations begin. Christmas can often bring many changes to your pet’s environment. It can mean an increase in emotional stress and excitement, or even physical disorientation because of furniture being shifted to make room for decorations. The household can be noisy with visitors and over excited children. The last thing you want during the holidays is to be separated from your pet because of health problems that can easily be prevented. Despite all the excitement, it’s important to remember that your pet won’t understand what all the fuss is all about and will be agitated if anything impacts their daily routine. Did you know that the majority dogs are frightened of loud noises, particularly fireworks. So if you are planning on celebrating this New Year’s Eve with a bang, it’s vital that you consider how it might affect your dog. Remember to be considerate and let your neighbours know when you will be letting off fireworks so they have time to prepare their pet should they need to. When dogs are afraid, they tend to hide away or cower in a place where they feel secure and safe. It is a good idea to provide a warm den for your dog where they can curl up and stay clear from any loud noises. Make certain that children know to leave them alone. children know to leave them alone. Christmas decorations are just as exciting for your dog as they are for you. A dog won’t be able to resist the excitement of Christmas baubles, tinsel, wrapping paper and small toys. Unfortunately, as attractive as they are, they make a prime choking hazard. Avoid a visit to Veterinary Emergency Centres this year by keeping small parts away from your dog and keep tinsel securely in place. Remember that no matter how cold and miserable it is outside, your dog will still need daily exercise. Try and keep them happy by sticking to their normal routine and giving them plenty of attention. A forgotten dog may misbehave simply to get your attention. Adaptil mimics the natural comforting pheromone released by a mother dog to reassure her puppies. There are diffusers, sprays and collars available, all of which have been proven to help reduce stress and calm your dog in uneasy circumstances. We use them here with great success. Homoeopathic remedies are also very effective and very safe. Unlike chemical sedatives they can be administered when the dog has already begun to show fear. Aconite is particularly helpful in cases of extreme fear and panic. You can get advice and remedies by mail order from Ainsworths Homoeopathic Pharmacy in London, telephone them on: 0207 9355330. Also useful is a combination homoeopathic remedy called ‘Anxiety’ showing an effectiveness rate of 91% in a controlled study by vets. This is available from The Company of Animals, telephone them on: 01932 566696. Zylkene is another natural product, derived from milk protein which can be used to help pets deal with difficult situations. CHRISTMAS FOOD: As Christmas is almost here, so are the many temptations that come with it. With all the different, mouth watering smells of freshly cooked Christmas foods lingering in the air, there’s a high chance that our pets will be just as tempted as we are. However, replacing their usual meal with a rich Christmas dinner is a recipe for disaster, an upset tummy and a very messy Christmas! Place mistletoe, poinsettias and holly only in very high sections of the tree, where your pet will be unable to get the tempting leaves and berries. They can cause heartbeat and blood pressure to drop. Remove strings and ribbons from gifts that are left under the tree. These items may seem like toys to an animal, but can easily choke him or her. Don’t decorate with edible ornaments. If it smells like food, a determined pet will find a way to reach it. Chocolate contains Theobromine which can be lethal to your pet. Generally, the darker the chocolate the more harmful it is. Tape the electrical cords of your Christmas tree lights to the wall so your pet won’t chew them. To discourage chewing on your light cords, spray them with bitter apple. Unplug the lights when not in use. Avoid glass baubles which may be too tempting to your pet. Protect from tree water – Tree water that keeps a tree from drying out can lure thirsty pets, but drinking sticky water can make them sick. Protect tree water by using screen or a sturdy mesh fabric which covers it using duck- tape over the pan. Keep your pet locked out of the room with the tree when you are away. If your dog is wary around people and you have strangers visiting the house, keep an eye on him and provide him with a quiet place to escape to if he wishes. Scared dogs may bite if they feel threatened (or just over excited), intentionally or not. Do ensure that everyone, especially children know how to approach and behave around your dog and in particular give it some space when it needs it. A little common sense, respect and understanding for the dog can avert a tragedy. 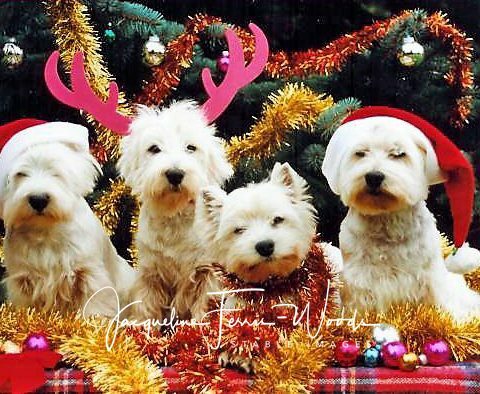 Every Christmas we get emergency calls regarding a westie that can’t cope with the festivities, over-excited children, a change of diet, over indulgence etc. Or a westie that has ingested something that it shouldn’t. We hope that these tips will help the festive season run smoothly for you and your pet but please remember FOR ADVICE ON HEALTH PROBLEMS PLEASE CONTACT YOUR VET.